What Are Our Shipping Options? We use UPS for shipping. You can choose between Ground, 2nd Day Air or Next Day Air. Most orders ship within 24 hours. This applies to all of our products, including non-personalized ketubot. 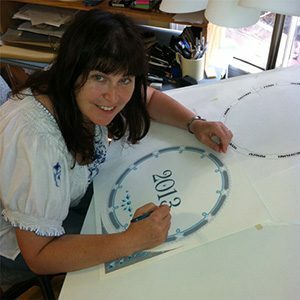 If you are ordering a ketubah that is being personalized, we ask for 2 weeks so that Mickie can personally hand-calligraph all of your personal information on the ketubah to match the existing calligraphy. We do not use ink-jet printers at all. If you have a rush order and have chosen 2nd Day Air or Next Day Air, we will usually ship even a personalized ketubah within 24 hours. If your wedding is coming up in a few days and you are placing a rush order, feel free to call us after you have placed your order, and we will let you know how quickly we will be shipping and when you can expect to receive your ketubah. In over 25 years, we have never been late to a wedding! What if the Ketubah Arrives Damaged? First of all, don’t worry. If your ketubah arrives damaged, we will replace it at no cost to you. Please notify us immediately and save the damaged original packaging and artwork so we can make the appropriate insurance claims with the shipper. Check the package as soon as it arrives because there is a time limit from the date of delivery for us to make a damage claim.